This pattern is available for $3.00. Wow! 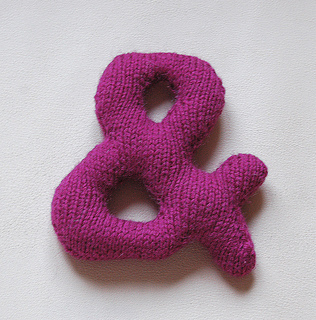 !…Now you can say so much more with your alphabet plushies by knitting a special AMPERSAND (&) symbol. 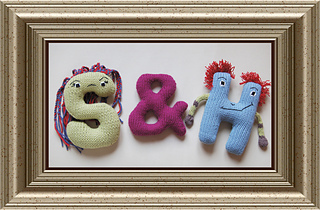 Just the thing for a lovingly handcrafted wedding or anniversary gift! The ampersand is designed on the same scale as my alphabet plushies. I used a lighter weight yarn so the symbol would be a little bit smaller than the letters. PLEASE NOTE: This pattern is ONLY for the ampersand symbol shown in the photo. Shemika and Harry are just posing with their friend to show how cool they all look together. ALSO NOTE: You are purchasing a PATTERN, not a finished knitted item. This is an original pattern by the Knit Knoodler.